Just because you are young doesn’t mean that you can’t change someone’s life or make a difference in the community. 13 year-old Palistar Yang hasn’t let his age be a road block for making a difference in the community. In the past year, Yang has given more than 300 hours serving as a Youth Counselor and tutor to younger children. He makes a difference in the lives of others by co-facilitating the Alternatives to Violence program at East Madison Community Center. While most children his age are enjoying the freedom of their summers, Yang is busy as a Summer Camp Counselor assisting with youth programming and supervision. Even though Yang is only 13, his actions inspire others and present him as a leader in United Way’s work in increasing volunteerism. As part of the Volunteer Engagement Mobilization Plan, United Way of Dane County is dedicated to increasing volunteerism in Dane County to create measurable results; our community has seen the inspiring spark. Many people come together to jump start the volunteering season during United Way’s annual event, Days of Caring. United Way Days of Caring is our annual volunteer event that officially kicks off the United Way Campaign. It is an opportunity for companies and their employees to get into the spirit of giving, experience volunteer activities and corporate team building, and help in the community’s work in the Agenda for Change. 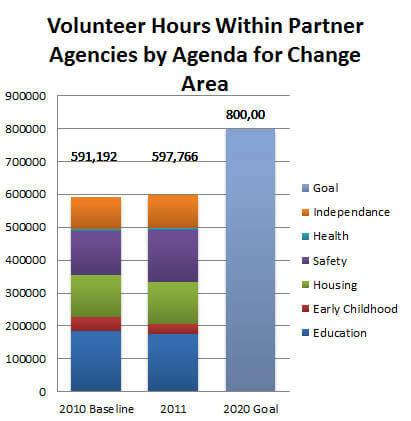 In 2012, nearly 3,000 people volunteered almost 10,000 hours Living United for our Community in multiple projects. The 2012 Signature Project, called “Ready to Read”, connected volunteers with young children in a reading experience. This volunteer opportunity allowed over 300 children the opportunity to read with a volunteer and receive a new book to take home with them. Exceptional volunteer individuals and groups, like the ones in Days of Caring, create an enduring impact in our community and deserve to be recognized. The United Way Community Volunteer Awards (CVA) is an opportunity to showcase the benefits to our community from volunteer involvement. Leading by example, the nominees and winners at the CVA encourage more people to engage in their community. Volunteerism is up in Dane County, but more volunteers are needed to help solve our community’s most pressing issues identified within our Agenda for Change. Join us in celebrating volunteerism in Dane County by attending the CVA on April 29, 2013 at the Madison Concourse Hotel and Governor’s Club.